Especially as I found it close to home in a place I hadn’t seen this species before. Such a lovely lavender blue. Not a color you’d see outdoors in Cornwall at this time of year, I dare say. There was a similarly coloured Salvia flowering in a nearby garden on Wednesday. 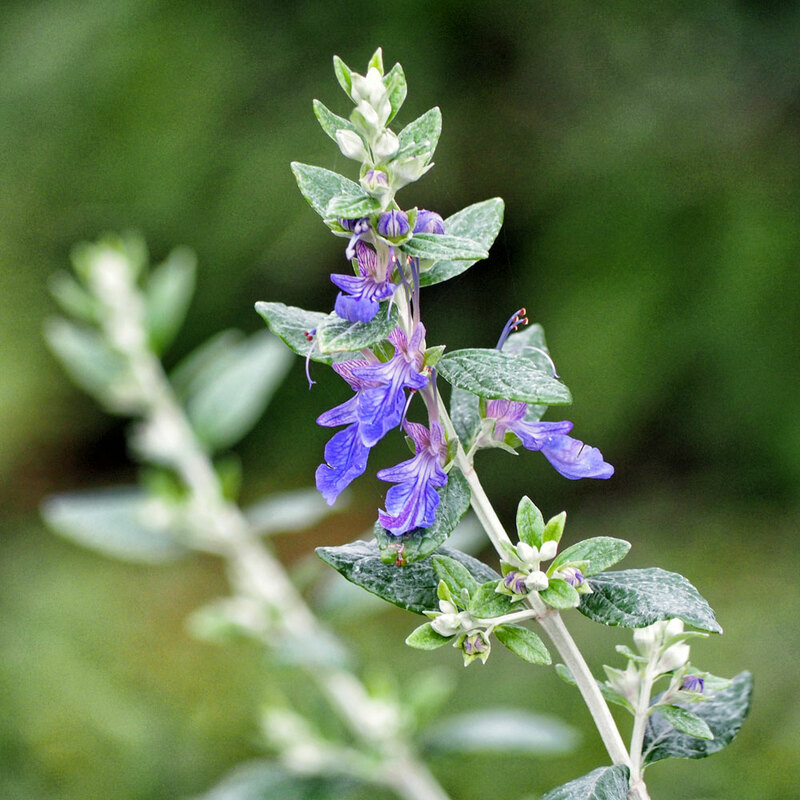 At least I think it is a Salvia!! I stand corrected. I hadn’t heard about Cornwall becoming a Texan territory. Haha… I notice I too got an echo!! It seems the idea reverberated. There’s a lot to enjoy in this photo: the color of the background, the “echo” of that second stalk, and the diagonal placement. So often vervains are shown vertically, and your unusual composition really increases the interest. I’ve found a couple of species of vervain right through December and January; they’re tougher than I realized. You’ve used exactly the same word that had occurred to me: echo. I thought of putting it in my text but decided to wait and see if it came up in comments. You didn’t disappoint. 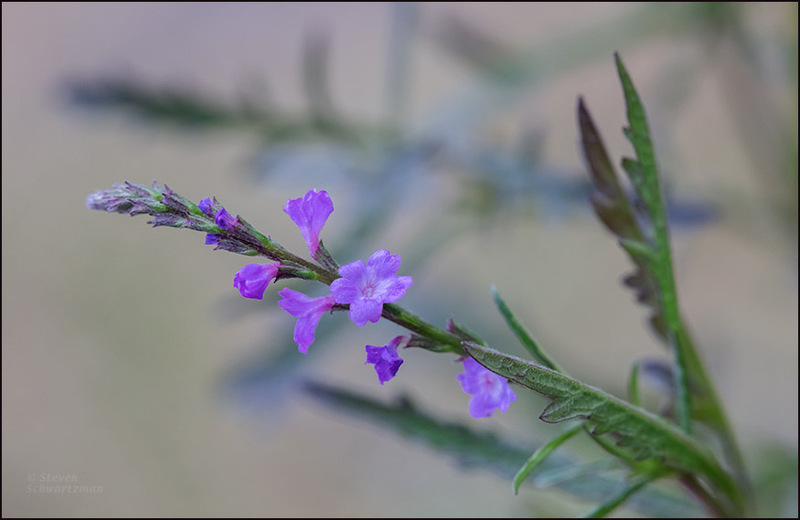 As for a vertical vervain image, I hesitated between this picture and a tall, narrow one of a nearby stalk that also had flowers on it. While each has its advantages, I settled on this one because I find it better artistically, in large part due to the “echo” and the diagonality. Such a beautiful color! A nice find on a winter’s day. A week or two later even more wildflowers made their appearance; I counted half a dozen species. Fewer are out now, at least in the places I’ve been, but it shouldn’t be long. I think I would do well in your climate in winter. I would love those flowers. In summer, not so much. The may well be as many people who dislike the half-year of summer here as the half-year of winter in Montana. Dainty little flowers, aren’t they? I just enjoyed Linda’s Scarlet Pimpernel and now your Gulf Vervain. Spring inches closer here but still months away. Nice to see flowers from elsewhere. This flowering vervain was a carry-over from the fall. A couple of posts later I showed an anemone, which is one of the first flowers of the new year, beginning in January and continuing into “official” spring. Botanical spring begins early here. No, not particularly sandy, but rather the limestone-underlain hilly terrain in my part of Austin.